Those trees are quite complicated. The links, materialized with lines represent parents/children relation, while the hyphened lines or arrows imply more distant relationsip (ancestor,...). 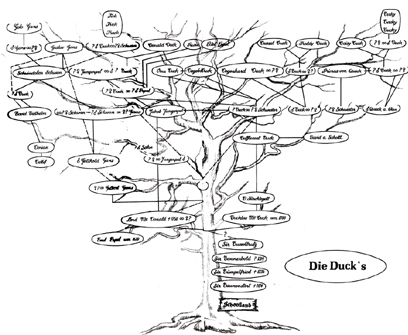 The table below lists all the characters and informations in order of appearance from top-left to bottom-right in Reiche's tree (I'll only deal with the German names, as the photograph of Schuijlenburg's I have is quite unreadable, but the quality is good enough to notice it's exactly the same than Reiche's). All of the names in the Grobian Gans one also appear in Reiche's version, which also contains new names, so you can also report to the table to analyse it. Golo GANS Shamrock GANDER He is Gladstone's nephew from an untitled story by Tony Strobl, first published in 1955 in "Four Colors" # 649. He then re-appeared in a few stories. Donald's nephews, who first appeared in a strip by Taliaferro from 1937. Daisy's nieces, who first appeared in Barks' "Flip Decision", first published in 1953 in "Walt Disney's Comics and Stories" # 149. Erwin ERPEL Sourdough Donald's cousin mentionned in an untitled story by Jack Bradbury, first published in "Donald Duck" #30, from 1953. Eitel ERPEL ? A character made up by Grobian Gans, who seem to have made bad investigations. Franz GANS Gus GOOSE Donald's cousin, since the cartoon "Donald's Cousin Gus", from 1939. He seems to be considered as a rather distant relative here. Gustav GANS Gladstone GANDER Donald's lucky cousin, since Barks' 1948's "Wintertime Wager", first published in "Walt Disney's Comics and Stories" # 88.
and Della DUCK Huey, Dewey and Louie's mother mentionned in Taliaferro's strip from 1937. Donald DUCK Donald DUCK You know who he is, don't you? Daisy DUCK Daisy DUCK Donald's girlfriend, since "Mr. Duck steps out", 1940. Gipfel-Duck Upsy Duck He is a relative in Tony Strobl's "Mastering the Matterthorn", from 1965, first published in "Walt Disney's Comics and Stories" # 293. Wastel DUCK Whitewater DUCK Donald's distant cousin from Barks' "Log Jockey", first published in 1962 in "Walt Disney's Comics and Stories" # 267, later called Abner "Whitewater" Duck by Don Rosa in his Duck Family Tree. We can see here that Don Rosa isn't the first one to have the idea of Fethry and Whitewater being brothers. Dagobert DUCK Scrooge McDUCK Donald's rich uncle, since 1947 in "Christmas on Bear Mountain", by Carl Barks, first published in "Four Color" # 178. Oma DUCK Grandma DUCK Donald's Grandma first appeared in a Taliaferro strip from 1943. Here, Grandma and Scrooge are siblings, as they have the same last name, which makes grandma Donald's aunt! Degenhart DUCK Lurch McDuck Scrooge's cousin in Strobl's "The Doony Desert Dilemma", from 1968, first published in "Donald Duck" # 116 and is called Degenhart Duck in German and Andrik von And in Danish. Primus v(on). QUACK Ludwig Von DRAKE Donald's nutty professor uncle from Austria first appeared on TV in an episode of "Walt Disney's Wonderful World of Color: An Adventure in Color" from 1961. In the 1962 publication of the story "Duckburg, USA" (1961, "Ludwig von Drake" #1, US), in the german "Micky Maus" # 35/62, Grandma's aunt is told to have married a Hofrat von Quack from Vienna, thus making Ludwig von Drake a cousin of Grandma Duck. Jakob JUNGERPEL Jake McDUCK Scrooge's uncle from Barks' "A Christmas for Shacktown", first published in 1952 in "Four colors" #367. 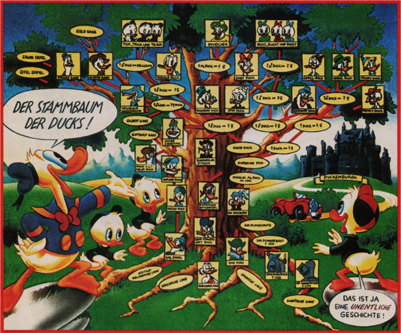 Jungerpel is the name which was used for the first publication of the story in Germany, but in Don Rosa's Duck Family Tree he's re-named Jakob Duck. Schwindolar SCHWAN Pokerface McDUCK Donald and Gladstone's deceased relative who owned a silver mine from Jack Bradbury and Carl Fallberg's untitled story first published in 1953 in "Donald Duck" #30. David DUCK Quagmire McDuck Scrooge's great-uncle, from whom he inherits in Barks' "Heirloom Watch ", first published in 1954 "Uncle Scrooge" # 10. Ebenezer McDuck Scrooge's grandfather, mentionned in Jack Bradbury's "Indian Takeover" (S 68064), first published in 1968 in the Italian "Topolino" # 680, and called Ebenezer von And in Danish. Ducklas McDUCK - 1700 Danblane McDuck Scrooge's pirate ancestor called Pap McPaper in the original version appeared in the Scarpa story "Paperino e la leggenda dello Scozzese volante", first published in "Topolino" #174, from 1957. Note that two other ancestors of Scrooge called Ducklas McDuck in the German version are mentionned in "Paperino e il calumet della pace", from 1961, and "Zio Paperone e i bracciali dei Mac Paper", from 1968. Sir Dagobert Matey McDUCK Scrooge's past incarnation, from Barks' "Back to Long Ago! ", first published in 1956 in "Uncle Scrooge" # 16. Scottish ancestors of Scrooge from Barks' "The Old Castle's Secret", from 1948, first published in "Four Color" # 189. These three ancestors of Donald appeared in an untitled story by Jack Bradbury, first published in "Donald Duck" #30, from 1953, in which Donald shows to the nephews a family album, with photographs of adventurer ancestors, and comments on it : Great grand-uncle Gumboot, a postman, fourteenth cousin Panhandle, a cow-bow pursued by Indians, and great great great great-grandfather Crockett Duck, a lumberjack. In the same story cousin Sourdough is just mentionned. In German, they're respectively Donald's great-great-uncle, great-great-great-uncle, and great-great-great-great-uncle, that's why they're on a direct line here. Emil ERPEL Cornelius COOT Duckburg's founder, from Barks' "Statuesque Spendthrifts", from 1952, first published in "Walt Disney's Comics and Stories" # 138. 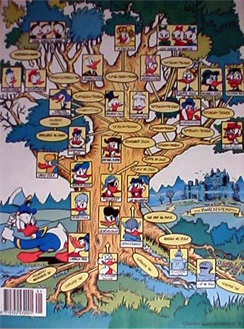 Interresting fact : Don Rosa isn't the first one to consider Cornelius Coot as being the Duck's ancestor, which is not a Barksian fact. Bootsmann BOTTERVOGEL Pintail DUCK Donald's past incarnation, from Barks' "Back to Long Ago! ", first published in 1956 in "Uncle Scrooge" # 16. David Fürchtegott DUCK Seafoam McDuck Later re-named Hugh "Seafoam" McDuck by Don Rosa, he first appeared in Barks' "The Horse Radish Treasure", first published in "Four Color" # 495 from 1953. Don DUGO Don Pato [?] A Spanish ancestor of Scrooge from Strobl's "The Golden Galleon", first published in 1965 in "Donald Duck" # 103, called Captain Doublon in French and Don Pato (Pato = Duck in Spanish) in Danish. Alexander DUCK Alexander McDuck A Greek ancestor of Scrooge called Alexander And in Danish, from Strobl's "Turnabout" (S 64107), first published in 1965 in Italian "Topolino" # 477.